Have you ever had just a couple drinks with some friends and suddenly you have an insatiable craving for hot wings or mozzarella sticks or those McDonalds fries you haven’t had in years? Why does alcohol make you hungry? Especially for unhealthy foods. What’s interesting is that alcohol is very calorically dense. One can of beer has even more calories as a large order of McDonalds french fries. So why would someone drink large amounts of liquid calories and then feel starving for more? 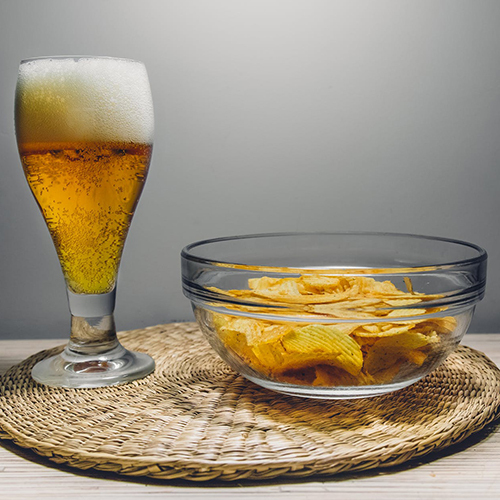 Well it seems that although the alcohol contains large amounts of calories, fat, and carbohydrates, the alcohol has a large affect on your brain, as well as your stomach. In a study done on mice where they gave them a bottle and a half to two bottles per mice over the course of a three-day period, they found that the signals in our brain that make us hungry are affected when we are in need of food, or when we have consumed alcohol. The receptors are called AgRP neurons, or Agouti-Related Protein, and they are located in the hypothalamus. “Our study clearly shows that the main area of the brain responsible for eating (the hypothalamus and its AgRP neurons) is directly affected and excited by ethanol, and that mice respond very strongly to its exposure by overeating for several hours afterward,” say study co-authors Sarah Cains, MD, and Craig Blomeley, MD. The scientists did a similar study, however, they blocked the AgRP receptors in the brain. What they found when they conducted the second study was that the mice ate a lot less when their brains could not send signals to the AgRP neurons. The alcohol caused the AgRP neurons to fire more often, stimulating the hunger part of the brain. Further studies have showed that alcohol can also reduce the amount of leptin in your brain. Leptin is the chemical in your brain that makes you feel full. It’s what gives you that good “ooh that was a good meal” feeling. Studies have shown that alcohol suppresses the amount of leptin in your brain. This means that while you feel hungrier when you have had some drinks, even after you satisfy those cravings for late night jack-in-the-box tacos, you will have a harder time satisfying the craving all together. So why do you eat food when you’re drunk that you normally would considered disgusting? Well alcohol affects the opiate system in your brain. Your brain has a system that is designed specifically to absorb opiate-like chemicals. They affect pleasure, pain, addiction, and reward. This is the system which tells you which foods you like and affects the way you think about the taste, texture, and palatability of foods. Alcohol increases the amount of these endogenous opioids in your brain. This is why alcohol makes you feel less pain, feel happier, and is addictive, but it also makes food that you would normally find disgusting seem like heaven. Overall, especially if you care about your health, your brain, and your waistline, the best way to avoid binge-eating is to not binge-drink.